Big Data Science course will cover the Advanced Analytical and Machine learning techniques using most popular tools in the analytics industry like Hadoop, Python and Spark. This course focuses on case study approach for learning and is a great blend of analytics and technology, making it apt for aspirants who want to develop advanced data science skills. This is our advanced Big Data training, where students will gain practical skill set not only on Hadoop in detail, but also learn advanced analytics concepts through Python, Hadoop and Spark. For extensive hands-on practice, students will get several assignments and projects. At end of the program candidates are awarded Certified Big Data Science Certification on successful completion of projects that are provided as part of the training. Students must have knowledge on Hadoop, Python and spark and also possess exposure to statistics in data analysis. This case study aims to give practical experience on Storing & managing different types of data(Structured/Semi/Unstructured) – both compressed and un-compressed. How leading companies are harnessing the power of Data Science? 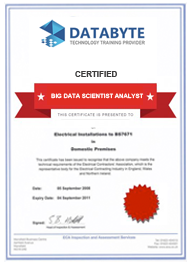 Our Certified Big Data Science program is exhaustive and this certificate is proof that you have taken a big leap in mastering the domain.